There are players where it’s almost impossible to see them as anything but legendary: Ted Williams, Babe Ruth, Lou Gehrig. Even in their flaws, they’re almost more than human; Babe Ruth’s love of excess and Ted Williams’ temper. There is one player who goes beyond legend though, in every way. Ty Cobb set almost 120 records, plenty of which are still unbroken almost a century later. He was the best at bat. He was the best on base. He was the best in the field. He was ferocious, relentless, fearless, untiring, unwavering and almost unbeatable for the 20 some odd years he played baseball. Even in his twilight years, he was one of the top players. He was also the most vicious, vile men to play the game. He never stopped fighting the umpires, the other players, the owners, the fans. He beat one fan brutally, despite the fact that the man had no hands. He took on three muggers single-handedly and beat one to death with his pistol. He hated African-Americans. He railed against integration. He beat one black groundskeeper and then, when the man’s wife intervened, he beat her too. There is no way to measure the amount of contempt and admiration he managed to garner during and after his career. He spiked other players and spiked the umpires. He stole home 35 times, a record that hasn’t even been approached. He was sneaky and underhanded. He was a master tactician. He would play so hard that he would bleed and then he would play some more. He was, with no exaggeration or hyperbole, the greatest baseball player to ever play in the major leagues. He was also, once again with no exaggeration or hyperbole, one the worst human beings to ever play the game. It is my belief that an angel was ejected from Heaven and sent to Hell, but, on the way down, he decided to play some ball. One of the most surprising things that I’ve read through-out my spring training, was that, prior to Henry, Werner and Lucchino buying the team, there was a lot of talk about abandoning Fenway and building a new park elsewhere. To me, even before I started my whole Baseball Project, this was unthinkable. Leave Fenway? But…it’s Fenway! It’s one of those places people think of when you say, “baseball.” It’s been around almost as long as the Red Sox have been around. 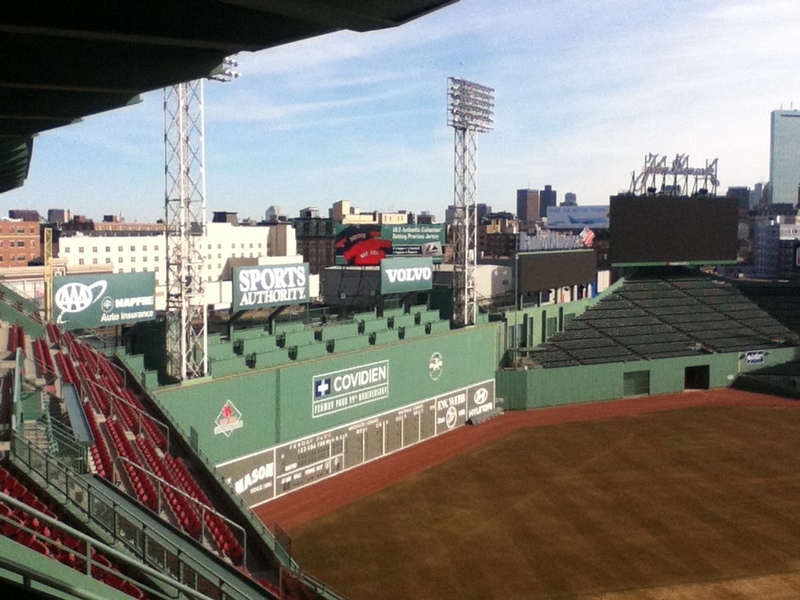 It’s been the home to Babe Ruth and Ted Williams and that Yaz fellow. You can’t leave Fenway. Since I’ve never been to a major league ballpark and since the season is still a ways out, I decided to take advantage of the Fenway Park Tours. After all, what better way to get acquainted with a ballpark than when it’s completely empty? When it’s full of screaming fans and vendors and balllplayers and reporters and crew, you don’t really get to appreciate it. You miss out on details that are going to be obscured by the excitement of the game. But a ballfield without players is such an odd thing to see. The history of Fenway is apparent from the moment you walk through the gate. There are dates everywhere; marking the first series the Red Sox won (1903, which was also the first World Series ever) and the years they won the American League pennant. There are the old bleacher seats that have been there since 1934 and they show it: There’s no leg room. There’s no room between you and your neighbor. And, as our guide pointed out, there are no cupholders. Everything has a story attached to it. 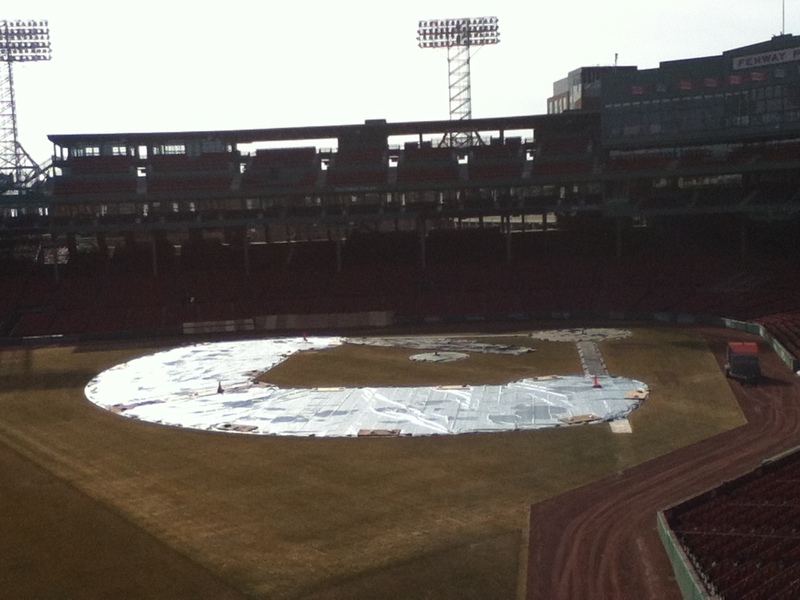 There’s the red seat out behind right field, where Ted Williams’ home run landed, the longest homer hit in Fenway. There’s the Green Monster, where Carlton Fisk’s homerun safely landed after he willed it there. The Green Monster in all its glory. Fenway is both one of the oldest and one of the smallest ballparks in the major leagues. It’s crammed into a tiny space, surrounded on all sides. Fenway represents Boston, in the way that Boston embraces its past and the future on the same street corner. History and progress in one square block. To me, a newcomer to the game and its history, it’s unthinkable that they even contemplated building a new park. I can’t wait to see it in action.